Ahalya Acharya, a young writer, travels from Yelachenahalli to Indiranagar (and back) all through the week, for work. Acharya switches lines at the Majestic Metro station and her easy hack will ensure you stick to your commute time. She recommends that you pick your compartment wisely. For those of you switching from the green line to the purple, make sure you grab a spot in the first compartment (or the second one if you are a dude). And if you are going from purple to green, take the last compartment. These are the closest to the stairs and you’ll leave the crowds behind as you make your way to the other platform, she vouches. Software developer, Reshma Rai takes the Metro between Hosahalli and Vidhana Soudha (or Cubbon Park) to reach her workplace on Cunningham Road. During the peak hours, she recommends that the ladies squeeze themselves into the compartment reserved for them since even when it is packed, it is still more comfortable than the rest of the bogeys. 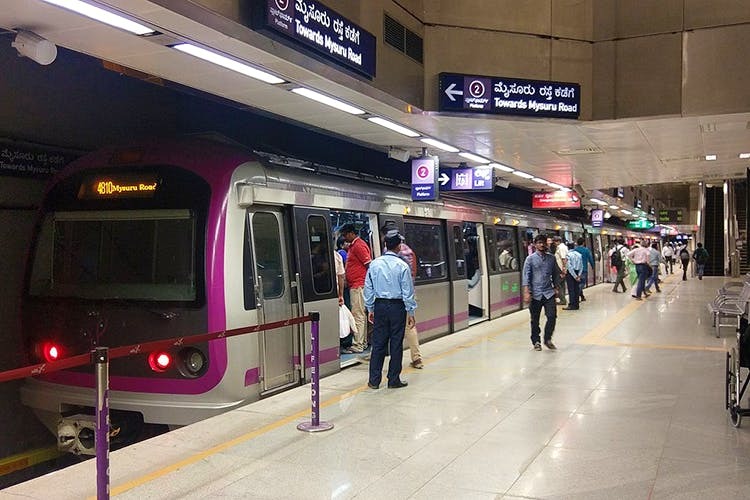 If you are one of the first stations on the Metro line and you find the first ride way too crowded, take your chances and wait for the next one, Rai says, because often the next Metro won’t be as crowded. Instead of taking an auto from the Vidhana Soudha station, Rai likes to keep things budget friendly by hopping on a bus that’s headed towards Cunningham Road or Shivajinagar. Compared to the Delhi Metro, Shabori Das finds the Bangalore Metro a breeze and she can’t say that enough. However, to make things more convenient, she switches on her GPS and Location, on her smartphone, every time she travels by the Metro. And since she frequently commutes from MG Road to Indiranagar for work, Google sends her timely prompts on the Metro schedule and she uses it to leave her office on time. This feature may however only work if the Metro station is nearby, she says. To avoid unpleasant experiences, Das always attaches her phone to her earphones or holds it in her hand and prefers not to take the late night trains. Mom to a precious three-year-old, Aditi Devi often takes the Metro from Trinity Station. If you are travelling with baby and pram, she recommends that instead of taking the rather difficult staircase, while exiting, you turn back and head to the lifts. At the stations, you are generally not allowed to do that but she’s always found the staff obliging and they lead you to the lift that goes all the way down. The Metro is also a great option when you are travelling out of town, she says. Since the family travels to Chikmagalur often, they take the Metro to Yeshwantpur and then hop on to a bus heading to their destination. If you plan to be a frequent traveller on the Metro (even if you take it once or twice a week), the Metro Card is a must. Madhav Shekar, who takes the Metro between Mysore Sandal Soap Factory and Byappanahalli everyday, says that card is a great buy because it offers a 15% discount on the fare. And you won’t have to waste time at the token window. To make the commute easier during the rush hours, he says that the trick is to stand in the area between the compartments where the crowds are always thinner. And to wear your backpack in front of you or hold it in your hand, so that it takes up less space and everyone, not just you, has an easy ride. Shruti Sandur, a budding sales executive, takes the Metro daily to her workplace. She also prefers it on the weekends. The Rajajinagar resident often takes the Metro to Orion and also to Mantri Mall, where you can walk from the station right into the mall. While commuting within the city, Sandur often stops by the Chai Point or The Brekkie Shop (both at Trinity Station) for a quick meal.